This entry was posted in Activity Sheet, Bible Crafts, Jacob, OT Crafts, Printables and tagged angels, covenant, God, heaven, Jacob, ladder, promise, sleep, staircase, stairs, vision. 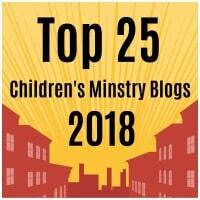 A great craft for the story of Joseph’s coat of many colors. Cut out all of the white of the inside of the coat from the template. Then cut out the whole figure. Place the figure of Joseph onto a self laminating sheet or contact paper, Joseph’s face-side down. Fill the inside of the coat with different color tissue paper. Cut out Joseph from the laminating sheet or contact paper. Stick Joseph onto your window with double sided tape. 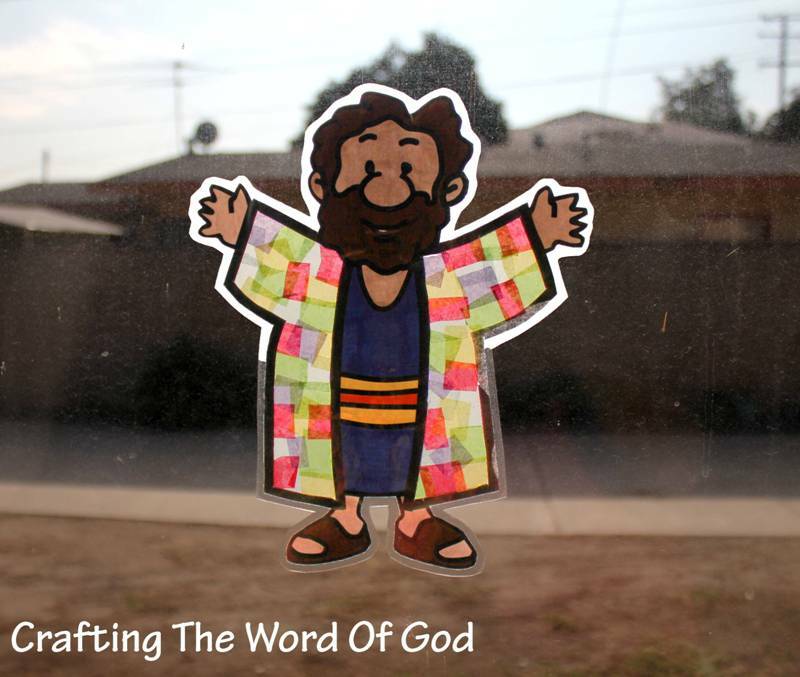 This entry was posted in Bible Crafts, Jacob, Joseph, OT Crafts and tagged bible crafts, coat, coat of many colors, Coat Of Many Colors Sun Catcher, colors, craft, crafts, Jacob, Joseph, sun catcher. This entry was posted in Coloring Page, Jacob, OT Crafts, Printables and tagged angel, bible crafts, color, coloring page, craft, crafts, God, God keeps His promises, Jacob, ladder, print out, printable, promise. God kept His promises that He gave to Abraham. God kept His promises that He gave to Isaac. And here we see a reminder of the kept promises He gave to Jacob in a dream. Fold the long piece on the solid lines creating creases. This will be the staircase/ ladder. Glue the ground/earth piece to one side of the staircase piece. On the other side of the staircase glue on the clouds. Finally glue on the angels. 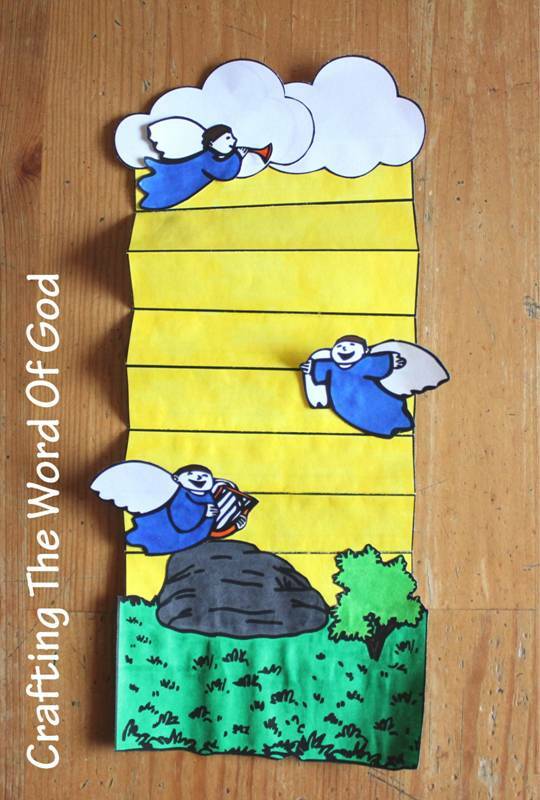 This entry was posted in Bible Crafts, Jacob, OT Crafts and tagged angels, bible crafts, craft, crafts, descendents, dream, God, God keeps His promises, heaven, Jacob, ladder, promise, staircase. Rather than wait for God to work for Jacob, Rebekah took things into her own hands. Rebekah convinced Jacob to trick Isaac and steal the blessing. As a result Esau became very angry at Jacob and vowed to kill him. Jacob had to leave his home and family. When we are waiting for God to act in a situation there are two ways in which we can respond. We can trust God and know that He is working for us or we can become impatient and act on our own. And as we can see from this story in the Bible the results are not good. This is the lesson we want our kiddos to go home with. That in hard and difficult situations, even if we can not see God acting on our behalf, we still need to place our faith in Him and trust that He is working for us. This craft will remind the kiddos of how Jacob and Rebekah both took matters into their own hand instead of trusting in the timing of God. Trace them onto a foam sheet. The color of the foam sheet does not matter as it will be covered with cotton balls. Cut out both shapes from the foam sheet. 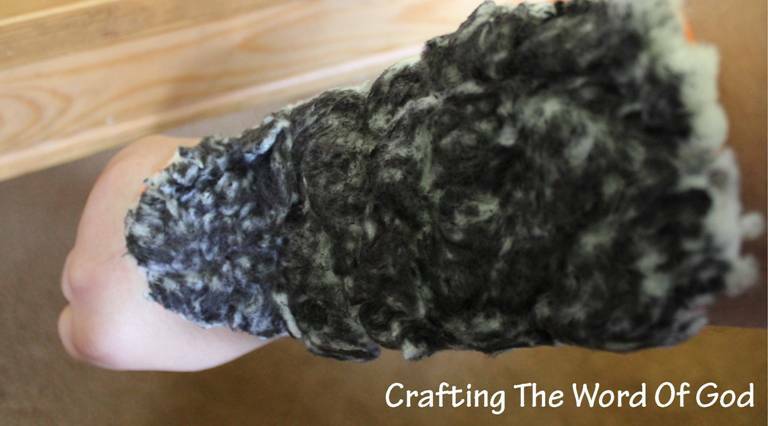 Using a glue gun, glue two pipe cleaners/chenille stems to each foam shape. One near the narrow edge and one towards the wider edge. Again do this for both foam shapes. Glue cotton balls to the foam shapes using regular glue. Cover completely. Slightly pull apart each cotton ball before placing it on the foam sheet. This way you will need less of them. At this point if your kids want to, they can use a marker to color the cotton balls. Recommended colors: grey, black, brown, or yellow. 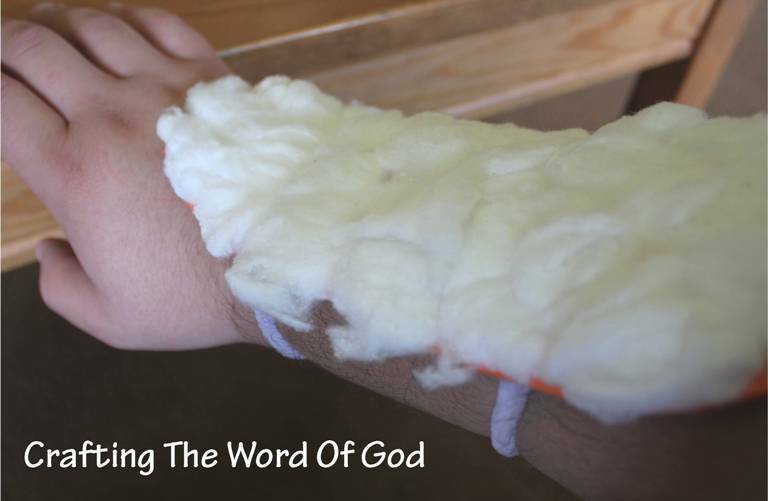 This entry was posted in Bible Crafts, Isaac, Jacob, OT Crafts and tagged bible crafts, blessing, craft, crafts, Esau, faith, God, Isaac, Jacob, promises, Rebekah, steal, trust.